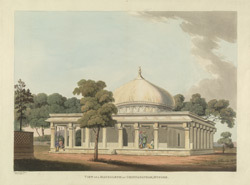 Engraving of a view of a mausoleum at Channapatna in Karnataka by Captain Thomas Fraser of the Madras Engineers from his own sketch and dated 1812. Channapatna is a hilltop fort situated between Bangalore and Seringapatam. The fort was built by Jagadura Raja in 1580 as his capital. At the turn of the 19th century, this region had been secured by the British from the Mysore ruler Tipu Sultan (r.1782-1799). This square mausoleum surrmounted by a large onion dome is one of two large Muslim tombs to the north of the town.